There has been an explosion in the demand for applications (or apps) for mobile phones in recent months. The meteoric rise of the iPhone and the Apple App Store has proven that people want to be able to access all sorts of functionality and entertainment on their smartphones. Google’s Android platform is growing into a serious contender with a range of excellent Android smartphones and a huge choice of apps and games. Google’s answer to the Apple App Store is the Android Market. This is where you’ll find thousands and thousands of the best Android apps and the best Android games. The vast majority of Android phones ship with the Android Market already installed, so if you access your programs screen you should see a program called Android Market. It is often just labelled Market and has an icon of a shopping bag like the one pictured. 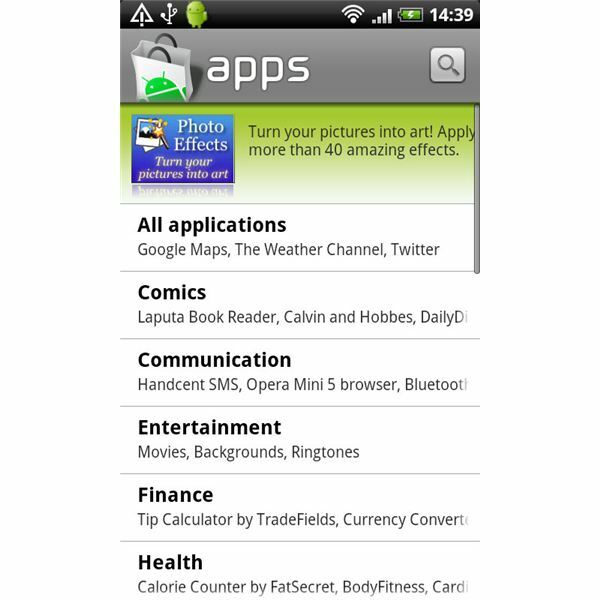 Clicking on the icon will launch the Android Market on your phone and allow you to browse the available apps and games. When it first loads up you’ll see three tabs along the top. Apps – this is where you’ll find a wide variety of applications. 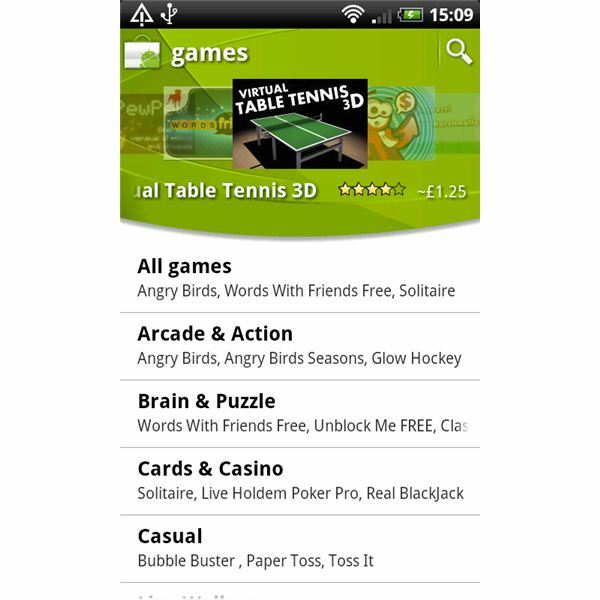 Games – this is where you’ll find all sorts of Android games. Downloads – this is where you can review what you have already downloaded for your phone and see if there are any updates available. You should also see a search option which is usually represented by a small magnifying glass icon. Click on this to type in a specific search term such as “alarm clock”, and you’ll get a list of alarm clock apps. In order to browse for apps or games, select the relevant option. You’ll find yourself faced with a range of categories. You can select a specific category or you can choose All. You’ll now find a list of the Top Paid and the Top Free apps or games. You’ll also find a Just in section, highlighting new releases. There is a problem with this method. The apps and games in the top lists are obviously shown to far more people and attract more downloads, which creates a loop boosting their popularity ever higher. Since there are well over 100,000 apps and games in the Android Market, this means there are some great options tucked away and some not so great options in pride of place. It pays to have a good rummage around and see what you can turn up. 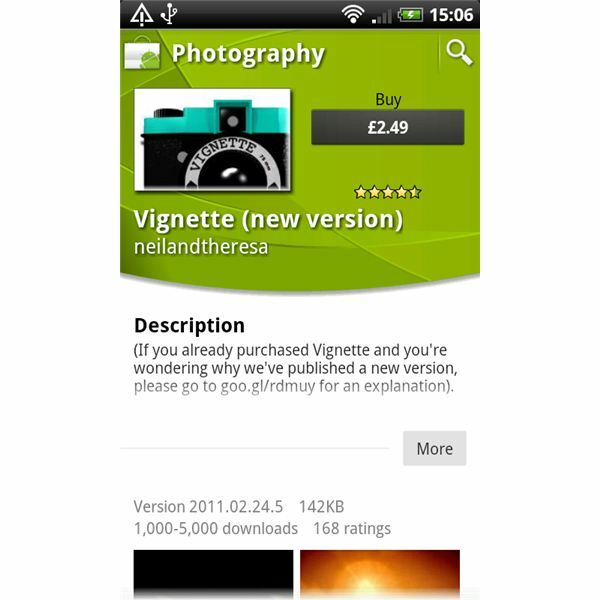 For every app or game listed in the Android Market you’ll find a rating out of 5 stars and information on the price. If you select a specific app or game you’ll reach a screen which provides further details on what the app or game does (usually with example screenshots of it in action). This screen will also contain user comments which give some idea of how the app has been received. The Install or Buy option at the top right allows you to download and install the app or game, but before it does so there is a security screen which gives you a complete list of the functions that the app will be able to access on your phone. For example, it will tell you if the app or game can access the network or GPS capabilities of your phone. If you are suspicious of anything listed there, or you feel it will be too taxing on your system resources, then you can choose not to download the app. Assuming you do choose to proceed, the app or game will download and install automatically and you can start using it. Check out the best free Android apps for some ideas to get you started. The main problem with finding useful apps or great games in the Android Market is the fact that they are listed pretty haphazardly and it can be difficult to find good quality downloads. There are an awful lot of poor apps and games which don’t work with every version of Android or every Android phone and yet lack any sort of warning that’s the case (in theory the Android Market should only display apps or games that are supported by your phone). The 5 star rating system is not the most reliable and it is worth checking how many ratings actually make up the listed score (you can see this information just below the description on the information page for each app or game). If there have only been three ratings then the overall score is far less valuable than if there have been over 100 ratings. User comments are also a mixed blessing. Sometimes people post nicely detailed wee reviews or mention useful specifics about the phone they tested on, sometimes they just post abuse. If the app doesn’t work at all for one person then they’re liable to mark it low and post a negative comment, however, that doesn’t mean it won’t work for you and it could turn out to be an app you love. 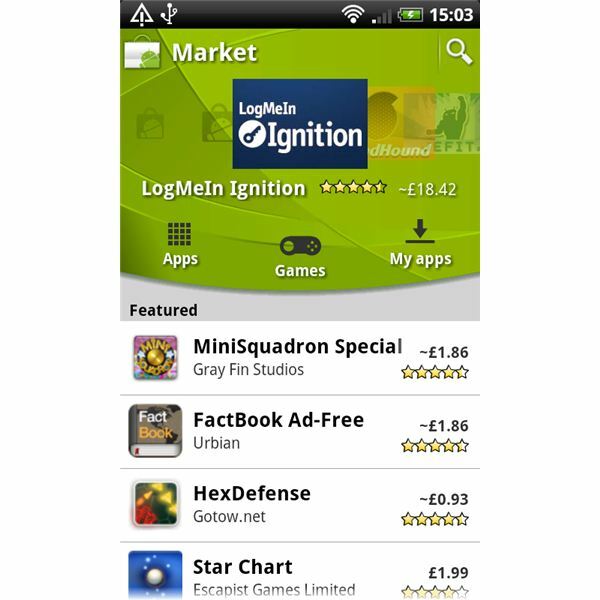 Check out How to Use Android Market Safely for more advice on finding good apps and games. Thankfully, the vast majority of apps and games are either free or offer some kind of free version or demo. This takes much of the risk away because you can try something before you commit to spending any money and see whether you like it. You can also check out more detailed Android app reviews online to find the best downloads, and then search for the specific apps you identify as desirable using the Android Market search function. This is a much faster way of getting quality apps from the Android Market than randomly browsing, because there is so much content to browse. You could also check out Android Market on your computer and identify apps or games that you want to download later. The website has been given a major makeover with a proper search function and the ability to select apps and games to install on your device. Check out our guide to the new Android Web Market for more on that. If you want to be able to install apps without Android Market check out our guide on How to Install APK files on your Google Android Phone. Google’s Android Market is a terrific resource and anyone who owns an Android phone will only get the most out of it by checking out some apps and games. 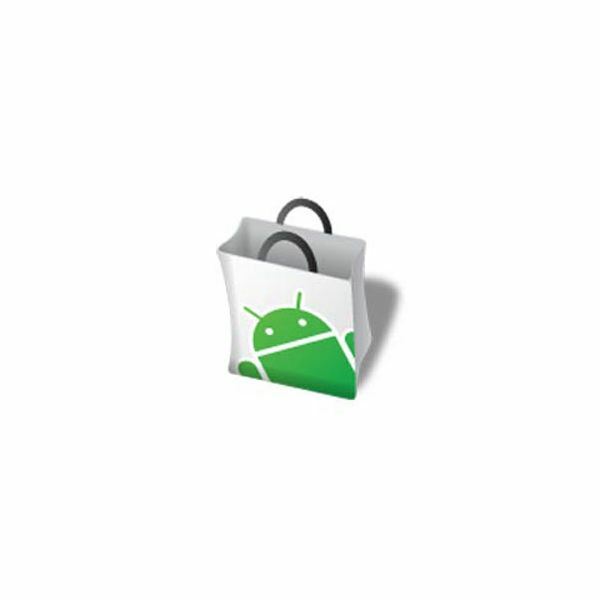 For some useful videos on how to use Android Market check out these official clips on YouTube.